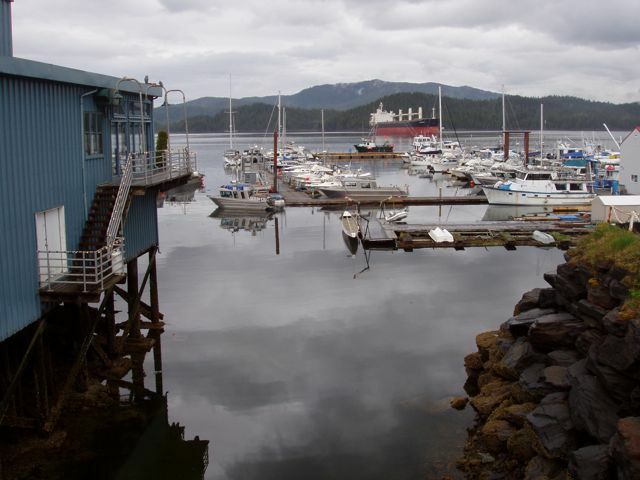 We've heard from other cruisers that Prince Rupert is a "scruffy little town", but that's not what we saw. The town is very nice, the people are very nice, they obviously take pride in their town, and it's a major west-coast shipping hub. Canada rail feeds coal and grain to waiting Asian ships, and in turn, the rail delivers containers of goods brought in by ship. It's an impressive operation. 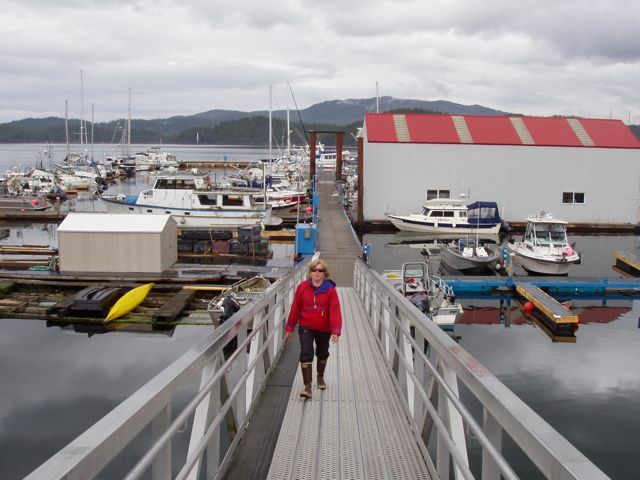 One cannot drive to Prince Rupert, but access is via rail, air, and water. Conni at the helm across Dixon Entrance South. We had thirty-knot gusts that made life interesting. The wind was whistling in the rigging. 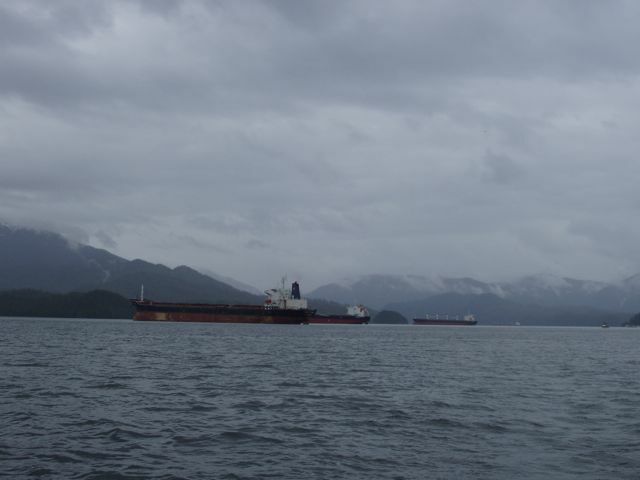 Near the entrance of Venn Passage, the north entry into Prince Rupert. 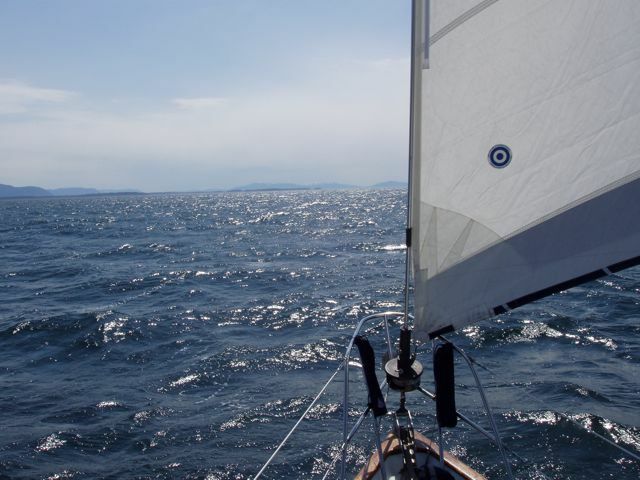 Under sail in big wind. 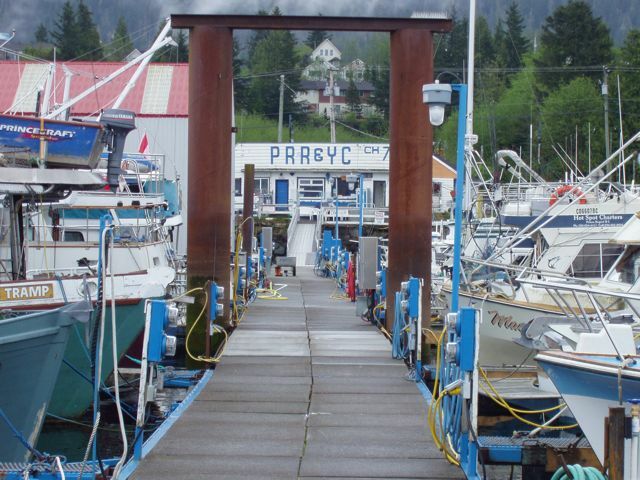 The end of Venn Passage and the city of Prince Rupert. We were finally in Canada! 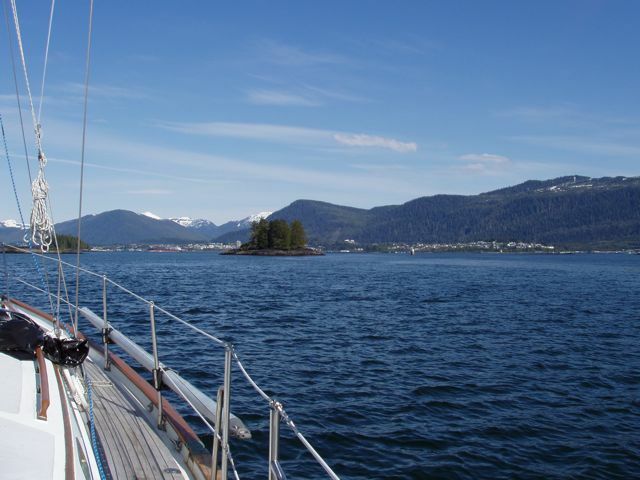 We had two sunny days, one as we entered PR and one at the dock there. We've had nothing but rain before or since. 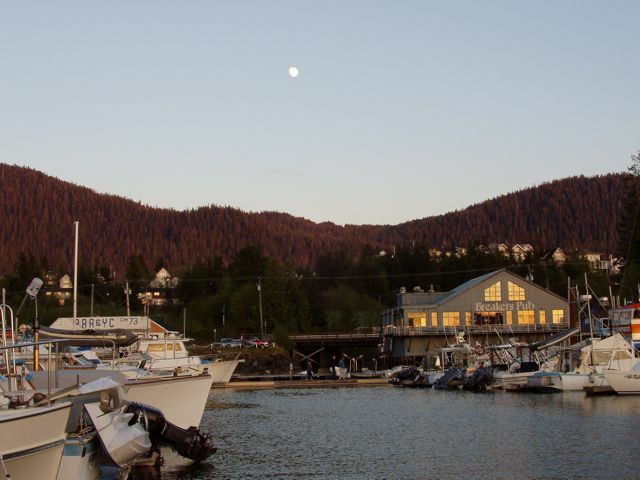 Our home for several nights: the Prince Rupert Rowing and Yacht Club. The harbor master, Buzz, was very friendly and helpful, meeting us on the dock to help us tie up on arrival. We had cheap power, good water, free Wifi, and food and booze nearby. How to make a cruiser happy! Wings in her PRRYC slip. 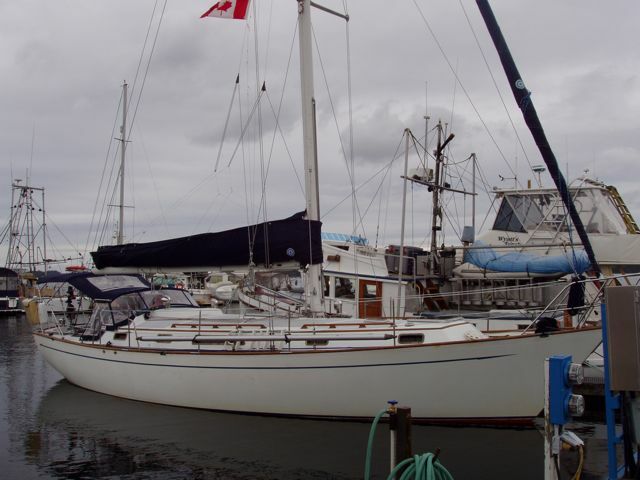 Note how low she lies with full fuel and water. David and Liz, you can see the dodger and bimini that cover the cockpit. Moon over Breakers Pub. This was taken from Wings' cockpit, so it's easy to see how close the bar was. Young and old, locals and visitors, the Breakers serves all. Great burgers and beer, and we enjoyed the grease! They also had free Wifi that we could reach with our Wifi enhancer: very nice. With Wings in the background, Conni and I head to Breakers. The PRRYC offered 2-Loony showers so we were cleaned up for dining off the boat. For non-Canadians, the Canadian dollar coin is called a Loony since it has a Loon on one side. The Two Loony coin is the "Toony". The PRRYC harbor ahead of you, the Breakers to the left. The local "Dragon Boat" crew has its boat hoisted up in mid-photo. This crew consists of breast cancer survivors. There's a cargo ship in the distance, one of many awaiting loads. The Cosco container facility off-loads containers for shipment. The containers are the "trailer" for a tractor-trailer load. We saw this container ship head out about two hours later. 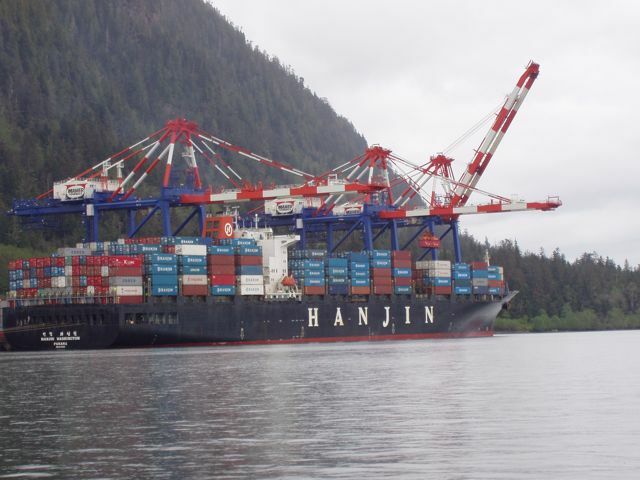 Prince Rupert's coal facility ships coal to the Orient. The mountains of coal are on the left. 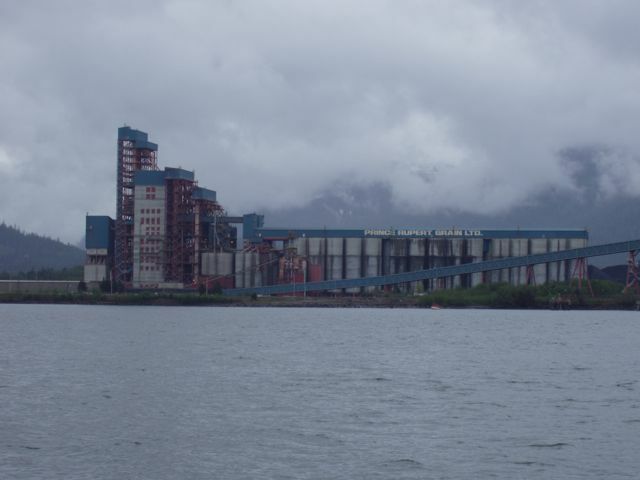 The Prince Rupert grain loading facility loads grain from Canada's heartland onto ships bound to fill hungry mouths around the world. 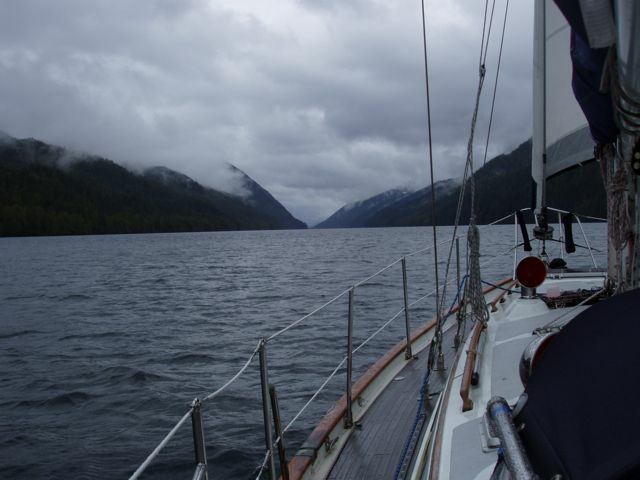 We spent an entire day traversing the Grenville Channel, an arrow-straight channel that is heavily used by commercial and pleasure craft of all sizes. The channel causes winds to move either up or down its length. 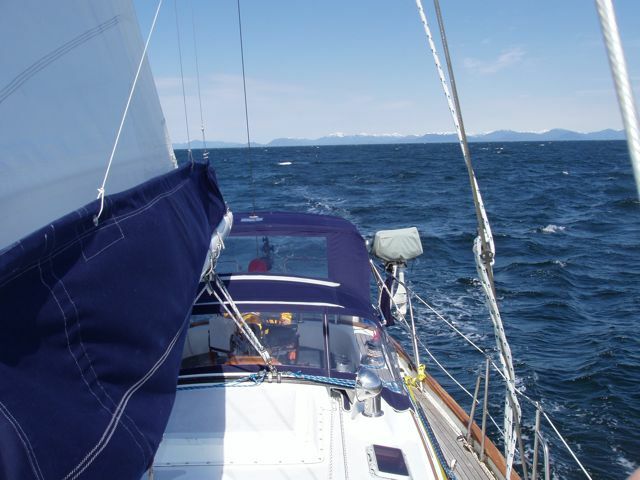 It's narrow enough to make "short tacking" against the wind a difficult task. 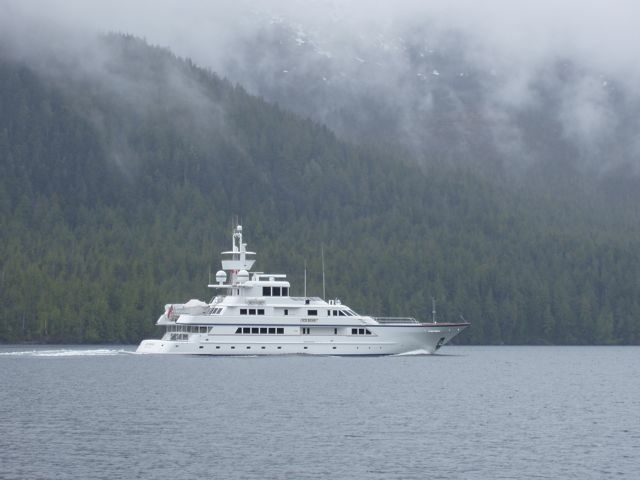 The 170-ft motor yacht Ice Bear as it passed us, heading north in Grenville Channel. It was registered in Grand Cayman. Our AIS equipment notified us much before even radar spotted her. Celebrity Infinity passes us on the way south. 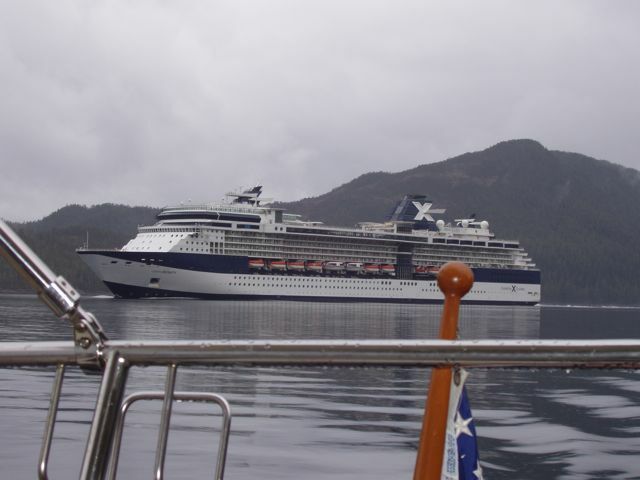 At 962-feet, it's a large cruise ship headed for Victoria, BC. Again, AIS let us know that she was coming up behind us long before we could find her visually on radar. Sharing a narrow channel with a 962-ft, 14-kt vessel was interesting.